When & Where: 4pm & 7pm - 26th April 2019 at New Life Presbyterian Church. 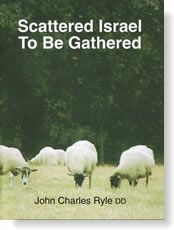 This booklet is the substance of an address originally preached at the Rectory Church, Marylebone, London, in May 1858. Taken from Bishop J.C. Ryle's book 'Coming Events and Present Duties'. As over 150 years have elapsed since this message was preached, there have been changes in the world situation, but the truth is unchanged. What is said about the particular missionary society, will, of course, apply to current missions to the Jewish People.